1/2 x 11 1/2 x 2 3/8 (HWD) in. Stylus adding machine (8 digit) with circular dials. Right most two dials colored white (for cents), the next 3 dials are red, and the last three are white again. 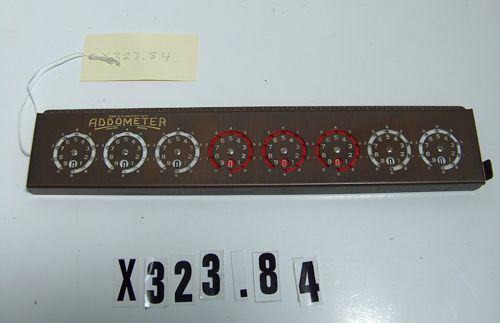 Instructions for adding and subtracting are on the side facing the operator, the side farthest from the operator is marked with graduations as an 11 inch ruler. Stylus fits into storage hole besice the clearing lever.